The fantasy of superheroes allows kids to free their imaginations from the normal laws of nature and biology, instead envisioning fantastic powers. 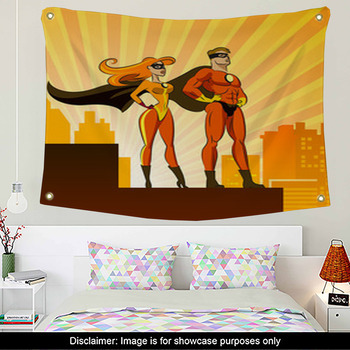 Give your kids our superhero wall art to amuse them and inspire them with the desire to fight evil and help other people. 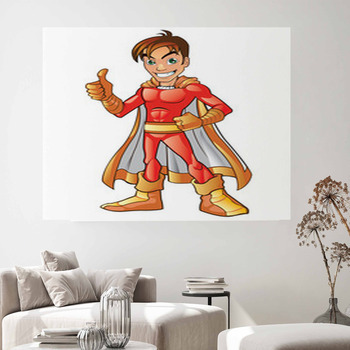 Toddlers will love wall posters or wall stickers that feature a funny cartoon superhero. These include a light brown dog with patches of dark brown around his big goofy eyes. 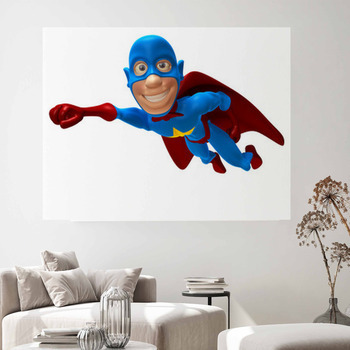 This is no normal dog, because this pup is soaring across the blue skies of your posters and wall decals in a red cape and a blue shirt marked with a yellow streak of lightning. Another animal superhero is our fighting hornet. 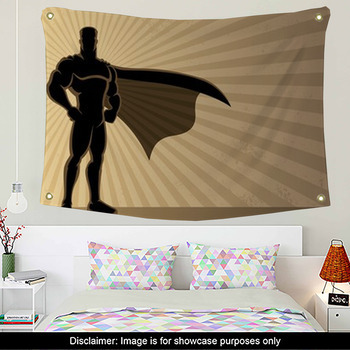 This fierce looking yellow hornet with red eyes and a black stinger is great for superhero wall art to give to older kids. 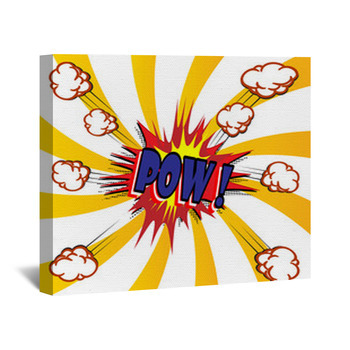 Preteens want wall art designed with classic style superheroes. 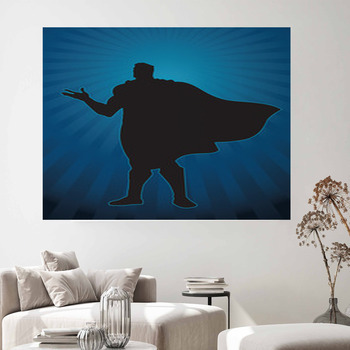 Choose wall murals that display a superhero in blue tights, glove and boots that show off his bulging muscles. 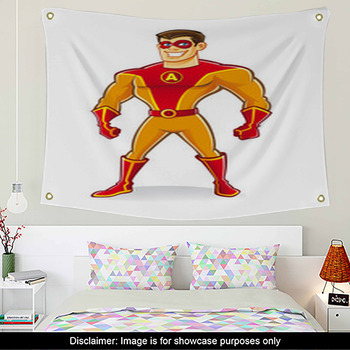 He's also wearing a long red cape that matches the streaming red lines that flow around him on this superhero wall art pattern. 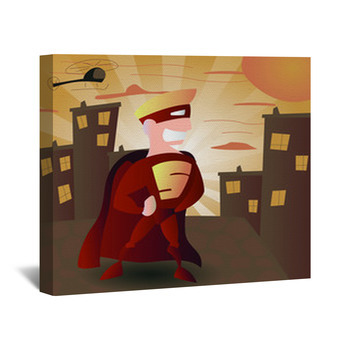 Let your daughter know that girls can be superheroes too, by giving her a custom canvas wrap that shows a blonde haired super heroine in red tights and a blue cape. 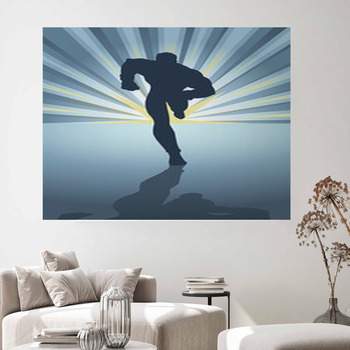 She's smashing through a wall with one fist, giving this wall art the cool impression that this lady superhero is coming right into your daughter's room to rescue her. 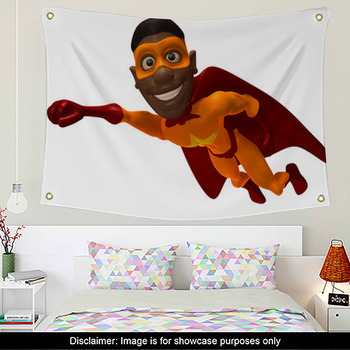 With our huge collection of superhero wall art, no kids should feel left out, because we have a superhero who will remind them of themselves. 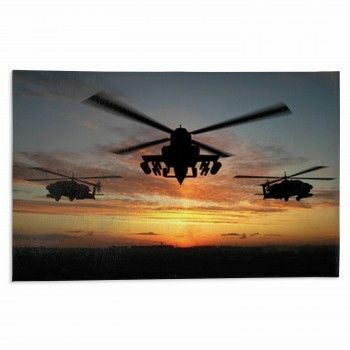 A perfect example of this is our wall hangings decorated with a female African American super hero standing proudly and confidently in her green and yellow costume.